At this address, the end of summer is attended by a flurry of activity both indoors and out because we are obliged to deal simultaneously with this year’s plants (being delivered to purchasers), next year’s plants (being propagated, potted, pruned, and sometimes imported), and plants that will be on offer several years from now (requiring photos, stock plants, hardiness trials, production plans, and greenhouse space projections). 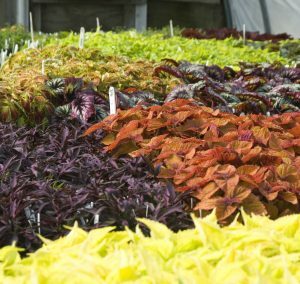 In the background is, of course, speculation about the likely date of first frost by which time greenhouses need to be covered, irrigation systems drained, and all outdoor equipment readied for winter. The mix of exhilaration and anxiety is familiar, even reassuring, as the sleepy saunter of summer changes to the brisk strides of fall. – Tulips in the beds adjoining our store that bloomed for an extra two weeks thanks to obliging weather. – Korean Dogwoods (Cornus kousa), planted to mask a greenhouse, became a feature on their own, alternating pink and white varieties that bloomed long and hard. A trial of ground covers at their feet produced mixed results about which more later. The trees’ fruits are now bright red and very cheerful, but seem not to be attractive to birds. 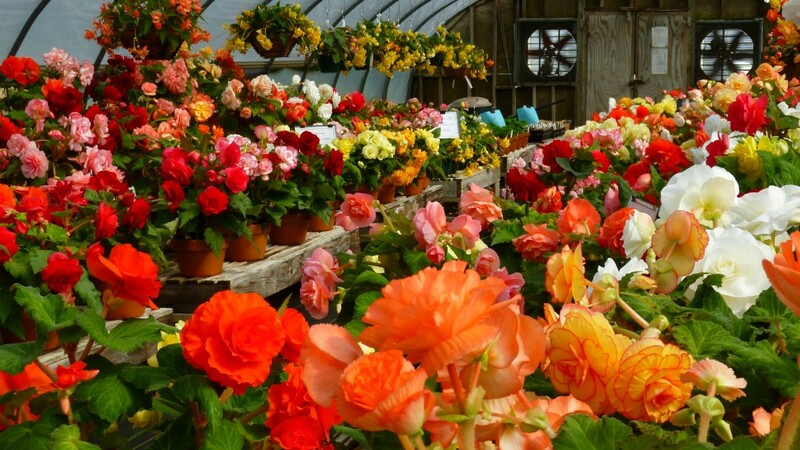 – Our Blackmore & Langdon Tuberous Begonia display moved to a new greenhouse two years ago, took a year to get adjusted, and then returned to top form, starting in June and still going strong this week. 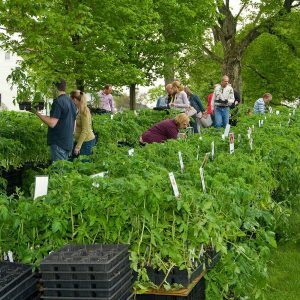 Our friends at the English nursery that bred these marvels actually called upon us to help them restore varieties they were struggling with, the ultimate compliment to our Head Gardener, Cheryl Whalen, who curates this collection. 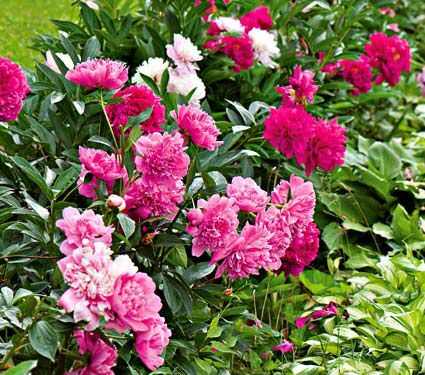 We sell the tubers only in spring, but you have permission to start dreaming now. 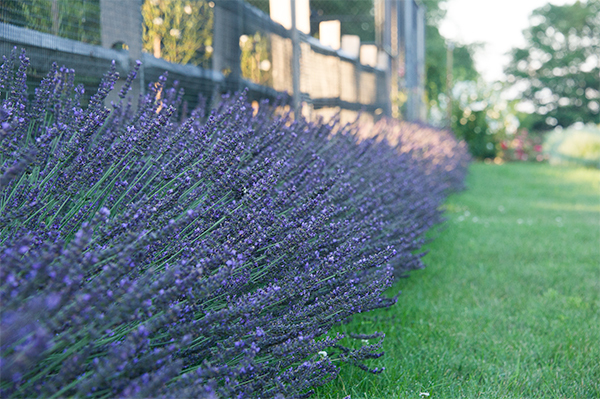 – After some nail biting caused by minus 18 degrees F in February, an astonishing border of Lavender ‘Phenomenal,’ 81 plants without a single loss, settled in comfortably in its second year and proved once and for all that Lavender can be grown in New England. The site faces south and is well drained. We trialed fragrant Sweet Peas on the fence behind and were entranced by the effect. 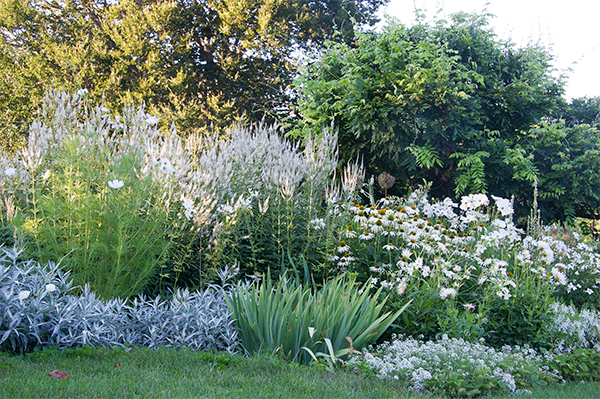 – A marvelous late summer showing in our beloved Moon Garden where strong late-blooming perennials Phlox paniculata ‘David,’ Veronicastrum virginicum ‘Album,’ and Echinacea purpurea ‘White Swan’ matched up with annuals and tenders such as Cleomes and Dahlias to make last week’s full moon something quite out of the ordinary. 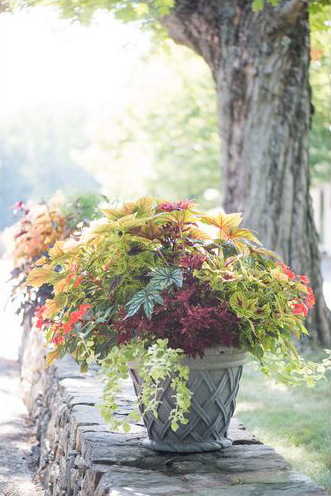 – Containers of annuals that changed their look and feel with every week of the season and are still strutting their stuff at the first week of September. Ms. Whalen, mentioned above, generates new designs yearly with seldom a disappointment, and many recipients re-order annually. 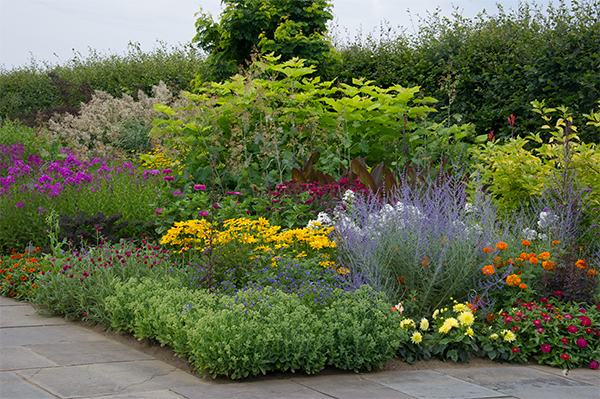 – The Lloyd Border, over 300’ long and 20’ deep, was once again heart-stoppingly beautiful through the entire summer and will remain so until a heavy frost. It’s worth a visit all by itself. A drone-based video is in production, which we hope will capture at least a fraction of this experience. It’s not too late to visit this year, and next year is a must. Looking backward in this way seems a little self-indulgent but perhaps can be justified on the basis of reminding ourselves, and you, what rich and varied joys are to be found in our gardens, and yours, at every time of year. Both big ideas and small can produce stunning beauty and deep satisfaction. 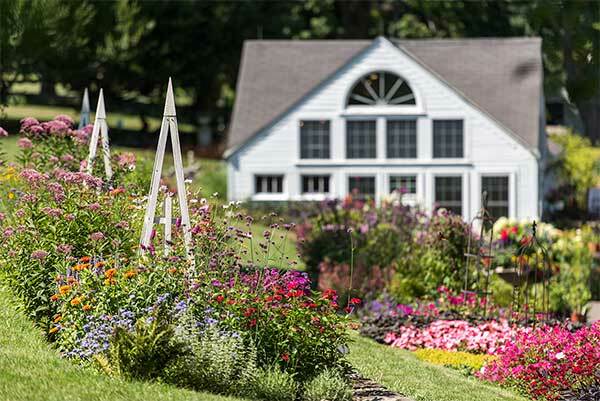 In addition, our gardens serve to support our proud assertion that we are plantsmen first, merchants second. Please read the following overtly commercial messages with that in mind. First – spring without Daffodils (properly known as Narcissus) is like kissing your sister, a pleasant ritual with no zip. The answer we recommend is our longtime favorite Daffodil Collection called ‘The Works.’ The name reflects its unique character as an assembly of 100 bulbs from 30 different varieties of the best traditional and recent Daffodils varieties, chosen and blended to provide a broad variety of colors and forms plus the longest possible period of bloom, roughly six weeks in our climate. Our bulbs are purchased under long-term contracts by our partners in Holland who, being Dutch, are always working to get the best possible value. 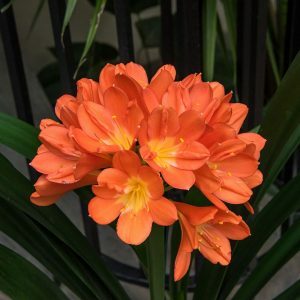 They secure top-size bulbs, all blooming size, that will put on a spectacular performance their first year in the ground, actually increasing their numbers thereafter in a site they like (good drainage and at least half a day of sun). 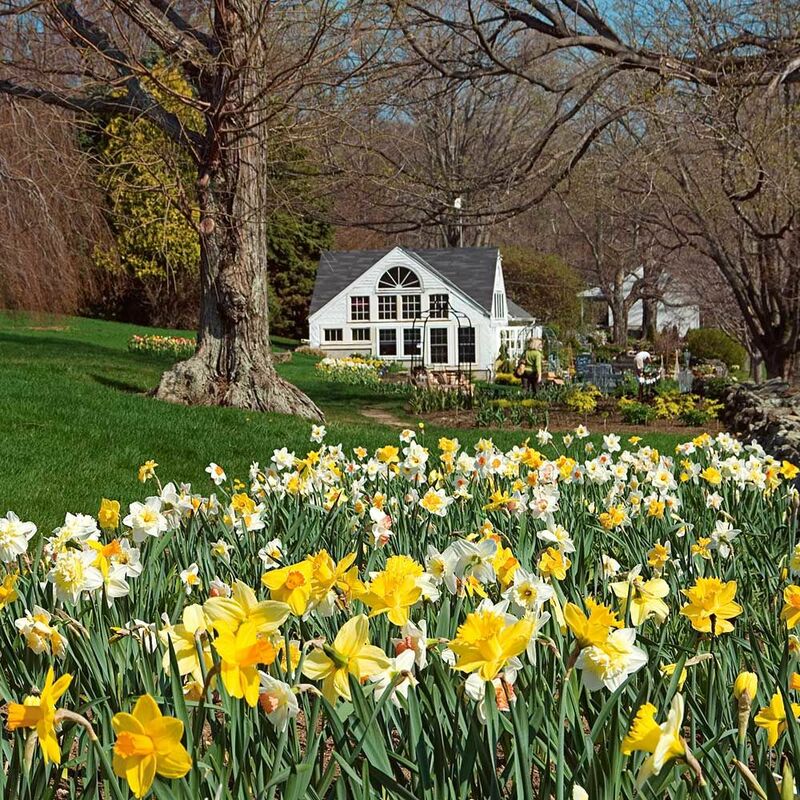 Of course, everyone knows Daffodils, but not everyone knows that they are long-lived, pest free, extremely winter-hardy, and absolutely and unconditionally immune to deer, which won’t touch them. 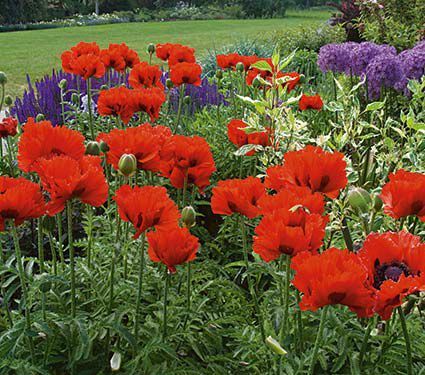 Thus, the biggest and brightest early flower of spring is also the toughest and most enduring. Scatter them in a meadow, along a path, through existing gardens, and at the edge of woods and count on a glorious display, plus armloads of fresh flowers for the house, for decades to come. 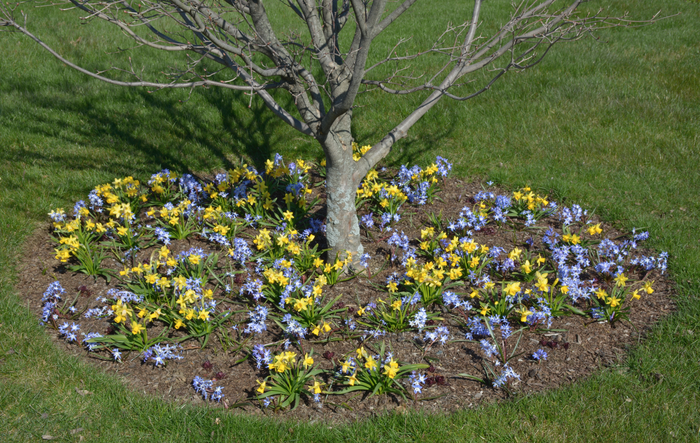 Please note that their natural period of dormancy means that Daffodils (along with many hundreds of other varieties or spring-flowering bulbs) can ONLY BE PLANTED IN FALL. Click here for details. 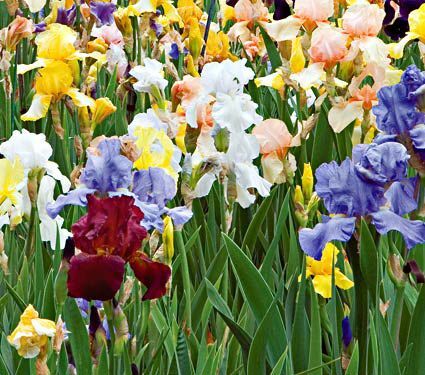 Second – To make your Daffodil commitment more efficient, Mother Nature kindly arranged that three other magnificent garden plants, all hardy from Zones 4-7, also require fall planting. This trio comprises Peonies, perhaps America’s favorite flower after the Rose, Tall Bearded (also known as German) Iris, the most overtly glamorous June blooming perennial (with one of the sweetest fragrances), and Poppies (Papaver) whose frilly June blooms can be as pale as dawn or crackle with the boldest reds and oranges in the world of gardening. If you can’t find something to love in this exquisite trio, have your eyes checked. Third – Many readers of this text will have nearby the ruins of the summer vegetable garden. 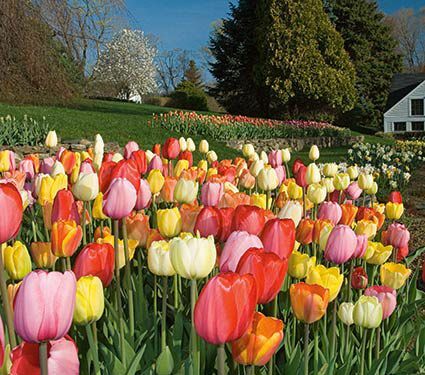 In our patch, we perform fall cleanup as part of a sequence that terminates with the lining out of many dozens of Tulips of all shapes and sizes. Once in the ground, they are promptly forgotten until their noses appear in spring. A couple of weeks later, we begin snipping small bouquets of every possible description, which could hardly be more delightful. 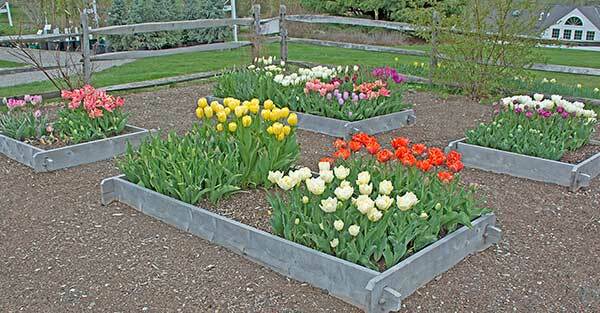 When bloom is spent, it’s a quick and easy task to fork out the bulbs, and probably about time to sow the peas. One of our imaginative associates named this switching process the Tulip Tango. That may be a little chic, but the principle is sound. 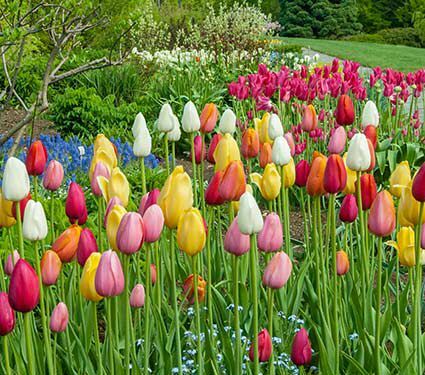 If you want to give the idea a try, consider a bag of our Pastel Stretch Tulip Mix, a collection of 50 bulbs, all different. It’s good value, good fun, and an education in itself. Click here. Are you getting the point? A few hours of scratching around in the garden on a bright fall day can deliver huge dividends in spring. 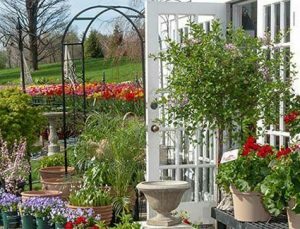 It’s not hard work, and the possibilities are enormous, whether you are starting with bare ground or presiding over an established garden. 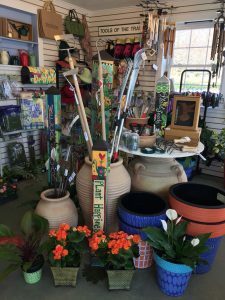 Our remarkable Customer Service staff, all gardeners and many of them Master Gardeners, stand ready to provide all the assistance you can possibly require, with a little encouragement thrown in.